Few, having association with our formal justice delivery system, will dispute that prevalent case disposal scenario is plagued with three evils i.e. delay, cost and complexity. Yet fewer will argue that this bleak state of affairs has noting to do with our procedural system. Procedural part of our legal system is largely regulated by two century-old laws: Civil Procedure Code 1908 and Criminal Procedure Code 1898. Both these super-voluminous laws are full of niceties and elaborated in minutest details, complete hold of which requires exceptional genius. These laws allow litigants to seek redress of almost every single grievance, whatever small that may stem from the proceedings of the court, by means of appeal and/or revision. Though envisaged to provide complete justice, these ever-elastic procedural provisions paved the way for serious injustice. As a necessary corollary of this elasticity, which perhaps had some efficacy century ago, it is possible for a notorious pleader to stretch a given case to an agonising length beyond the contemplation of a layman. These laws are good for mechanical disposal of disputes but not for judicious application of human mind. To worsen the situation we belong to the legal family of adversarial system as opposed to its inquisitorial counterpart. This makes our legal system extremely lawyer-mediated so as to render the judge a passive actor in judicial proceedings. Here lawyers virtually direct the course of proceedings, length of the suit, discovery of evidence, examination of witnesses and what not. Thus, more often than not, private interest of a lawyer subdues the public interest of speedy trial. As an essential result one finds our civil administration of justice unduly costly, inordinately slow and consequently unequal in that it leaves virtually no real chance for an under-resourced litigant against a wealthy barrator. But this awful condition is not unique to Bangladesh rather all the members of adversarial legal family encounter the same problem. The way some of them went to resolve this problem is to opt for some functionally efficacious attributes of inquisitorial system, one of which is popularly known as 'case management'. For better understanding of general readers it may be mentioned here that adversarial system is generally adhered to by countries that were once colonies of the United Kingdom. On the other hand countries of continental Europe and their former colonies adopted a rationally more sensible method of settling disputes they call inquisitorial system. In adversarial system judicial proceedings are typically controlled by the pleaders of the disputing parties. Judges are supposed to perform merely an umpiring role and are disallowed to intervene the proceedings. Conversly, judges in the inquisitorial system are more inquisitive in their conduct of cases and empowered to exercise greater control. While the inquisitorial system is solely devoted to unfold the truth, adversarial system place overriding importance on ensuring a level-playing field for contestants so that through rigorous clash between lawyers of both sides the truth can emerge by itself. Being a lawyer controlled system, the outcome of a case in an aversarial system is not so much dependent on the merits of the case as it is on the comparative skills of the concerned lawyers. It implies that you can demand justice under this system only when you can ensure sound supply of cash. But to be truthful it must be said that both the adversarial and inquisitorial systems have their relative advantages and disadvantages and over the decades there has been a debate to resolve where the balance lies. In today's world the debate gradually loses much of its rigours as somewhat convergence is taking place between these apparently divergent systems to meet practical necessity. Thus in adversarial systems, societal pressure to strike a balance between 'speedy trial' and 'fair trial' made 'jurisprudential purity' to give way to pragmatism. This triumph of functionality over traditional rigidity prompted the conventionally adversarial nations to install 'case management' in their judicial system. * identifying and reducing issues as a basis for appropriate case preparation. Another important aspect of case management is the scheduling of each particular case. Same procedural judge is to prepare a schedule detailing the anticipated progress of that case at different stages along with respective time limit. It will then be referred to the 'Trial Judge' who will be responsible to periodically monitor proper maintenance of the schedule as developed by the 'Procedural Judge' and make necessary modifications in the litigation plan as warranted by circumstances. Pleaders, and in the time of necessity parties, are to be involved all through the process. If any party is found to be in default and guilty for unreasonable delay the court will make him/her pay the price in the shape of compensation payable to the innocent party. This fear of monetary loss certainly minimises the chances of both derelictory and dilatory tactics. 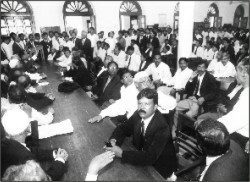 The basic idea is to make a fundamental transfer in the responsibility for the management of civil litigation from litigants and their legal advisors to the courts.It is really significant to note that a number of countries including pioneering States of adversarial legal culture like USA, UK, Canada and Australia made almost simultaneous efforts to get purged of the traditional stubbornness of adversarial system by introducing 'case management'. And this strategy to fight the 'delay' factor proved worthy as their primary hard works are now paying off. The USA enacted the Civil Justice Reform Act in the year 1990 to induct 'case management' system in their civil administration of justice. Australia opted for case management in pursuance of a sound background paper called 'Judicial and Case Management' prepared by the Australian Law Reform Commission. But the most remarkable and most publicised headway in this regard is made by a State considered to be the birthplace of adversarial system: the United Kingdom. The UK owes its reform in civil administration of justice to a report prepared by Lord Woolf. Lord Woolf's report on procedural reform of the civil justice system, titled "Access to Justice", was commissioned by the Lord Chancellor in 1994. Its importance as a complete overhaul of the system can hardly be overestimated. Lord Woolf was entrusted with the responsibility to make an in-depth inquiry into the loopholes in existing system and suggest possible reforms in a comprehensive report featuring clear guideline to follow in implementation of the concluding recommendations. Accordingly Lord Woolf published an interim report in 1995 and submitted his final report in 1996. English people are now cashing in on the famous Woolf's Report. Being inspired by the advancement in introducing case management in other countries and its consequent impact India took initiatives to work out modalities for implementation of case management formula in their civil procedure. A five-member committee headed by the Chairman of Law Commission of India Shri Justice M. Jagannadha Rao was constituted on 30 October 2002 pursuant to a direction issued by the Supreme Court of India in Salem Advocates Bar Association, Tamil Nadu vs. Union of India. Accordingly the Committee scrutinised relevant documents from foreign jurisdictions and arranged consultations with local stakeholders. The bottom-line drawn by the Committee was emphatically in favour of its introduction in India with some indigenization of the idea considering India's very own legal culture and practice. This report had been wholeheartedly received by the Supreme Court of India and the High Courts were requested to frame rules as per the report. Except some stray efforts in the form of introducing provisions on 'mediation' and 'arbitration', the vibrant trend around the world to shift the pendulum of case-control from lawyers to judges has hardly gained any interest in our country as yet. But the acceptance of this idea in our neighbouring nation, that shares almost the same legal legacy and culture, suggests that we can well adopt 'case management' to get rid of delay to a considerable measure and thus bring greater sense to our judicial system. The writer is an advocate and member of Dhaka Bar Association.